I am depressed to report that Summer and I have finished our project here in Louisiana and are being reassigned to Darlington, South Carolina. We leave next Friday. Although I am happy to have a job, excited for a change of scenery and a slow-down in pace, I am very sad to be leaving this amazing city. I love(d) it. Too much maybe. Fortunately for us, we have a week off from work and can spend it doing all the things we didn't get to do thus far. And fortunately for you, I plan to document everything. In no particular order, an incomplete list of things I love about New Orleans. 1) Complete and utter disregard for traffic laws. What's that vehicle, you ask? Yep. It's an old man. In a wheelchair car. Driving down the middle of the street. And then crossing that street. 3) Beads everywhere! Even in the trees! Left to right: Brandon, Annie, Ernest, Summer (but she doesn't count because she's coming with me). Fried catfish, shrimp, baked mac and cheese with sausage and green beans from Gloria's Place. 9) The way people alter the One Way signs. Some say "One Day", some say "One Love", etc. 10) Distinguished gentlemen having a chat on the street corner. 11) Lionel Batiste. Oh yah. 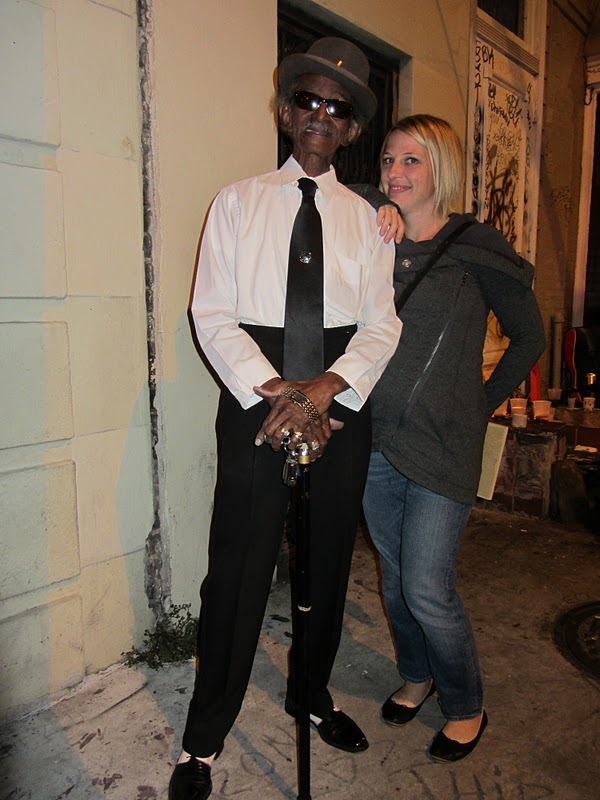 I met the coolest cat in the French Quarter last night. This is the third time I've seen him and each time he keeps getting cooler and cooler. I kept my cool though as I asked for this photo. Kind of. I think I asked him to marry me. If I wasn't on my way to Darlington, I just might have had a chance. I dare you to show me anybody cooler than Mr. Batiste. I will be back. Oh yes, I will. Lionel and I This city and I belong together. Go back out and see if that guy is still out there moving aimlessly through streets in his wheel chair. I suspect from photos he may be unconscious and in his hunched over state, is leaning on his joy stick. I suppose you are right in that I should be concerned about the poor man. It's just such a common sight here. Yesterday there was a man carrying a passenger on his wheelchair, driving right down decatur. She was in nurse's scrubs. I asked Glinda, our bartender friend if that lady is the guy's nurse. She said, "no, she's a drunk. She wears that crap all the time."